Q : Are you a licensed company? Q : Are there additional charges for using a credit card to pay? A : No there are no additional charges for using a credit card. Q : Can I book a tour with you and pay for the tour when I get picked-up? A : Yes you can, but you need to phone the office 076 209-154 to confirm total price and we send you voucher. Then you pay the driver when picked up. please bring correct money. Q : What´s the language the tour guide would speak with the tourist ? A : The tour guide is English speaking guide. A : If the customer is not present for pick-up at the place and time specified on the tour voucher, no refund is applicable no matter the reason and any claims need to be submitted by the customer to the customer´s travel insurance company. Q : Do you offer additional discount if I buy several tours with you? A : We have already the lowest prices available and therefore are margin is very low For each Tour and does not allow for further discount. A : You will be notified prior to the tour and offered the tour on another day or you will get a full refund. Q : How will I be picked-up? A : An air-conditioned minibus will come to your hotel and the driver will look for you in the reception. Should he not find you, he will ask for you at the reception desk. After the tour you will be dropped off outside your hotel. Q : What if the bus is not coming to pick us up? A : Call us if the pick-up bus has not arrived 15 minutes after the specified pick-up time we sent you and we will sort it out with the tour operator and call you back to notify you. This may happen when the tour operator is picking up other customers before you. Q : What if I prefer vegetarian or halal food? A : All tour operators offer vegetarian choices. Just enter in the information box on the shopping cart page that you want vegetarian food and we will book that for you. Halal food is served on all tours. Q : What if I cannot print or forget to bring the tour voucher to the tour? A : That is not a problem but the tour operator would like to have the tour voucher to facilitate their administration. You can show the voucher on your smartphone or just note down the tour voucher number. 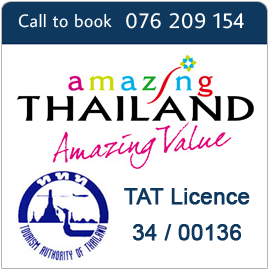 A : We do not Provide Free Airport Transfer ,Phukettour.com operate daily tour only. Q : Is the price in the website for private tour ? A : No, those prices are for join tour and private tour. You can see in the website.